owns 1.625 acres. The last small piece of land was acquired in 1975. In former years, the house and grounds immediately surrounding it were enclosed by a white picket fence with a swinging gate on which a rising sun emblem appeared. The wide brick chimney, with inset closet, and much of the original woodwork are still in good condition. The Inn is significant for its unusual brickwork as the massive chimney on one side is made of all header bonded brick through the entire height. The rooms in the house are furnished with pieces dating from the late 18th and 19th centuries, although not original to the house. Other pieces are on display throughout the home and in the small museum downstairs. 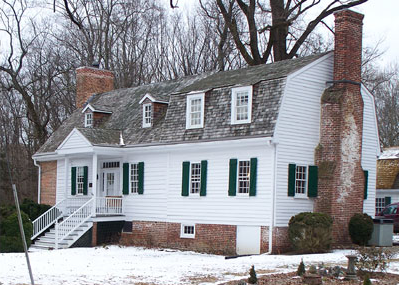 earned two grants from the State of Maryland to assist with this important, ongoing preservation work. Marker Text: Rising Sun Inn Home of Henry Baldwin 1753-1793 Owner of Rising Sun Farm, Part of Howard's First Choice. He served in the Maryland Line 1777-1783, and was successfully promoted from sergeant to lieutenant. He was an original Member of the Cincinnati. Acknowledgements: The Rising Sun Inn is owned, operated, and maintained by the Ann Arundel Chapter for the past 95 years. This property took second Place in the Eastern Division in 2011. The property is funded by the Ann Arundel Chapter, NSDAR and private stocks. Public Hours: 2nd Sunday of the month, 1:00 P.M. to 4:00 P.M.